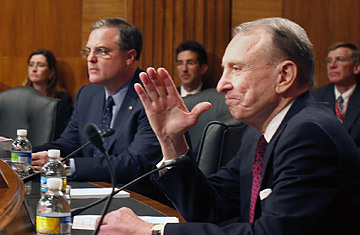 Pennsylvania Republican Senator Arlen Specter turned the 111th session of Congress upside down on Tuesday by announcing that he will switch parties and become a Democrat. The move was the product of weeks of intensive negotiation between Specter and Democrats in the Senate and White House, and it favorably alters the balance of power for President Obama as he is facing tough votes in the months ahead on health care, energy and budget bills. "We are thrilled to have you," Obama reportedly told Specter on the phone just a few minutes after he learned of the switch on Tuesday morning. In a statement, Specter said, "Since my election in 1980, as part of the Reagan Big Tent, the Republican Party has moved far to the right. Last year, more than 200,000 Republicans in Pennsylvania changed their registration to become Democrats. I now find my political philosophy more in line with Democrats than Republicans." Specter was facing a nearly impossible primary challenge from his conservative nemesis, Pat Toomey, whom he defeated by just 17,146 votes (or 1.6% of the vote) in 2004. Specter's unpopular vote in support of Obama's stimulus package in February drove many of Pennsylvania's diminishing Republican votes to Toomey, giving him an edge of 41%-27% in a recent poll. This came after some 200,000 Republicans switched parties to vote in the Democratic presidential primary last spring and have not changed their registration since. The combination of the events made it extremely unlikely that a moderate like Specter would emerge victorious from a GOP primary next year. "I am unwilling to have my 29-year Senate record judged by the Pennsylvania Republican primary electorate," Specter said in his statement. "I have not represented the Republican Party. I have represented the people of Pennsylvania." The switch dramatically alters the political terrain for Obama as his second hundred days in office begins  and as his allies in Congress try to turn his campaign promises into legislative realities. With the increasing likelihood that Minnesota's Al Franken will be seated in the Senate after his contested election last fall against incumbent Republican Norm Coleman, the Democrats will reach the all-important 60-vote threshold that allows them to override any Republican filibuster, at least in theory. "Senator Specter will strengthen the hand of mainstream, pragmatic Democrats, particularly on health care," Senator Ron Wyden, an Oregon Democrat, said. Democrats have not had a reliable, working filibuster-proof majority since F.D.R. in the 1930s, though Specter made it clear in his statement that "my change in party affiliation does not mean that I will be a party-line voter any more for the Democrats than I have been for the Republicans." See more about a filibuster-proof majority. See "Obama's 100 Days: Behind-the-Scenes Photos."